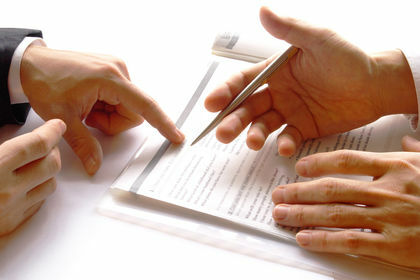 Your company description appears on job postings, your company profile, your LinkedIn page, and your company website. People will copy and paste your language to use in their blog posts and press releases. If you want to make sure everything being said about your employment brand is consistent and correct, then consider refreshing your own profile as we enter a new year. Imagine you’re searching for Marketing Coordinator jobs on JobsInNH.com. You go to the search bar, you type in Marketing Coordinator and receive a list of matching jobs. You click on a few posts, and the job descriptions seem identical. The only thing truly standing out in each job advertisement is the company description. In this case of job postings, the company description is what convinces someone to apply. “What” a person does is not as important as “Who” they’re doing it for. That’s why it’s important for your company description to sell your opportunities. Compare your company descriptions to a competitor’s. Who would you rather work for? If the answer is your competitor, it’s time to spice up your company description in your employment ads. Start with your company’s mission statement. Why do you exist? Why should anyone care? What’s your culture like? It’s tough to put into words, but if your employees had to describe it, how would they communicate what it’s like to work at your company? Do you have a company ethos? If so, include it! If not, do you have core values that are distinct, different, and that you’re proud to share? You should also share the standard perks employees come to expect from employers. Including this information fulfills a job seeker’s mental checklist before they decide to apply. It’s never easy talking about yourself, but writing an effective company description once does all the talking for you. Put yourself in the shoes of a job seeker; include the basics and the unique aspects of your company, and you’ll have a description that accurately sells your employment opportunities. If you enjoy the description, chances are that your ideal candidates will too. 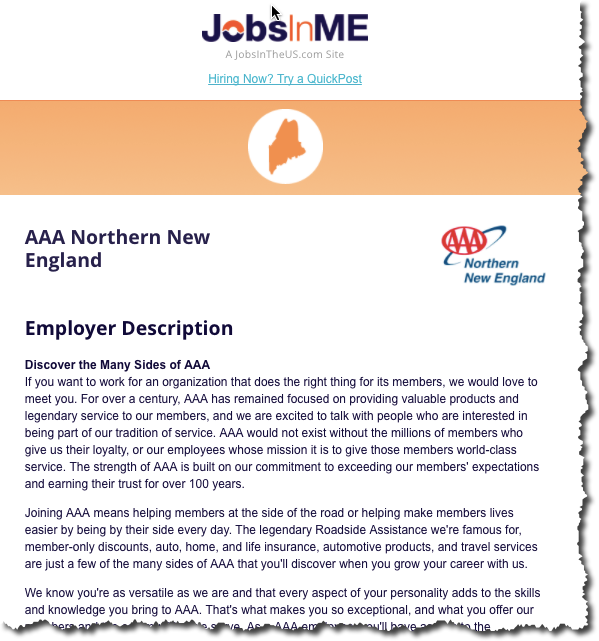 AAA of Northern New England is a good example of a well written company profile. It sells the mission of the company, lists the perks and benefits and provides perspective on why you should work there.